Can I just guess my PD? What is single and dual PD? What is the average pupillary distance? Pupillary distance, sometimes referred to as pupil distance or just PD, is the distance between the center of each pupil and the bridge of your nose measured in millimeters. Pupillary distance is essential for crafting prescription glasses because it helps us know where to place the center of your vision on your lenses. Without a correct measurement, the prescription power of your lenses will be off-center from your eyes and you won't be able to see out of your glasses, even if your prescription is otherwise 100% correct. You may not have realized, but each time you purchased glasses from an optometrist, they measured and used your PD to craft your lenses. Unfortunately, this measurement isn't always included on the print-out prescription you receive after an eye exam. So if you want to order eyeglasses online, you can either ask your optometrist for your PD or measure it yourself. If obtaining your measurement from your optometrist isn’t possible, no worries—you can measure it from home using our special ruler! Scroll down to our tutorials now. Do not guess your pupillary distance then order prescription glasses! Pupillary distance must be accurate for prescription glasses to properly work. Think of it like guessing your shoe size: If you end up with a pair of shoes too big or small to wear, you would need to size your feet properly then order a new pair. The same principle applies here—guessing will result in you not being able to see out of your prescription glasses properly and you will have to order a new pair with the correct pupillary distance. Monocular PD, sometimes referred to as single PD, is the measurement of the center of each pupil to the bridge of the nose. Binocular PD, sometimes referred to as dual PD, is total distance between the center of both pupils. Which is more accurate: monocular or binocular PD? Our eyes aren't symmetrical, meaning one may be a bit further from the bridge of the nose than the other. Breaking it down, one person's binocular PD may be 58.5mm total, but their monocular PD may be 27mm for their right eye and 31.5mm for their left. Monocular PD allows us to be as accurate as possible when crafting your lenses, especially in the case of progressives—which are lenses that include prescriptions for both distance and reading. A binocular PD of 50mm or lower is typical for a child. So if you get those values, we recommend you check your ruler and methods then measure again! Measuring with a friend is the preferred method to measure your pupillary distance at home. For this tutorial, you will need a friend and our special ruler. If a friend is not available, scroll further for our tutorial on how to measure on your own. 1 Print our tip sheet, which includes a special ruler to measure your PD. Ensure it's scaled properly by comparing your Driver's License against the key. 2 Have your friend stand approximately 8 inches away or more. Hold the center of the special ruler straight over the bridge of your nose. 3 To measure your right eye, stare straight ahead and close your left eye. Your friend should close their right eye and note the mm mark on the ruler directly above the center of your right pupil. 4 To measure your left eye, stare straight ahead and close your right eye. Your friend should then close their left eye and note the mm mark on the ruler directly above the center of your left pupil. 5 Repeat this process at least three times to ensure you have an accurate measurement. To measure on your own, you will need a mirror and our special ruler. Measuring with a friend is the preferred method. If you have a friend available, scroll up for our how to measure with a friend tutorial. 2 Stand in front of a mirror approximately 8 inches away or more. Hold the center of the special ruler straight over the bridge of your nose. 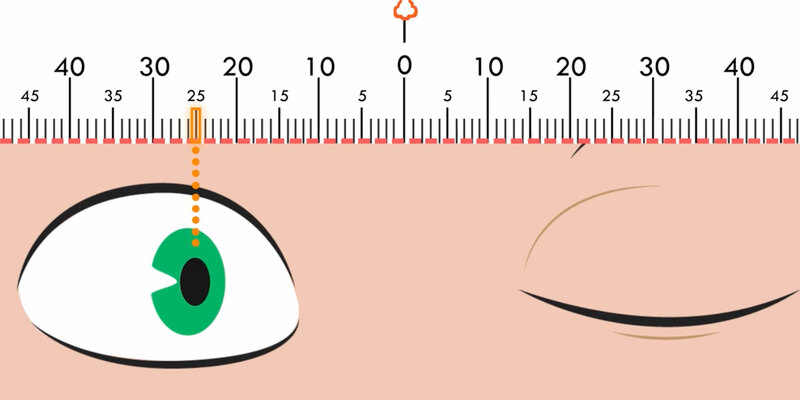 3 To measure your right eye, stare straight ahead and close your left eye and note the mm mark on the ruler directly above the center of your right pupil. 4 To measure your left eye, stare straight ahead and close your right eye and note the mm mark on the ruler directly above the center of your left pupil. Congratulations! Now that you have accurately measured your pupillary distance, you’re ready to order prescription glasses online.